You could speed things up by increasing the serial port speed and not stopping for the serial port. 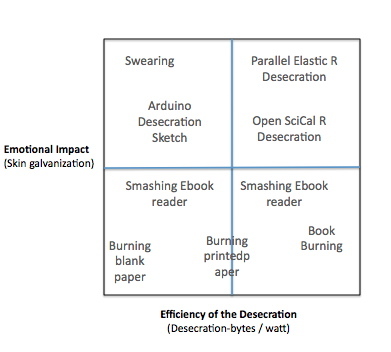 Maybe just print: "Desecration in progress..."
Also, you could "scribble on the pages" by ORing each byte with a random number. "Rip the pages" by clearing a random bit- ANDing with a random number. XORing is something that can be done to a byte that I can't think of as an analogous desecration to a book. Thank you very much, I really needed a laugh tonight. That was hilarious! Brilliant idea. My only addition would be to possibly move to a very high frequency chip, don't heat sink it, reduce any and all laminar flow (while assuring a decent oxygen supply) and then watching the entire processor go up in flames. This "book" burning would only happen once but would be effective. You'd also be burning the internet and all of your personal documents in essence. Unless you just moved your memory storage to a different device, that is. I like the idea of ripping pages and scribbling - that's great. I suppose I could even break bytes into nibbles, then swap their order. Ha. @chris - ha! the sad thing is i know exactly what you're talking about because it's happened before. you could build a floating h-bridge connected to an ac charger, and get the same effect - ha. actually, i wonder if desecration of data on a distributed drive storage (cloud?) is like tearing someone's limbs apart (see movie: Troy). ha.